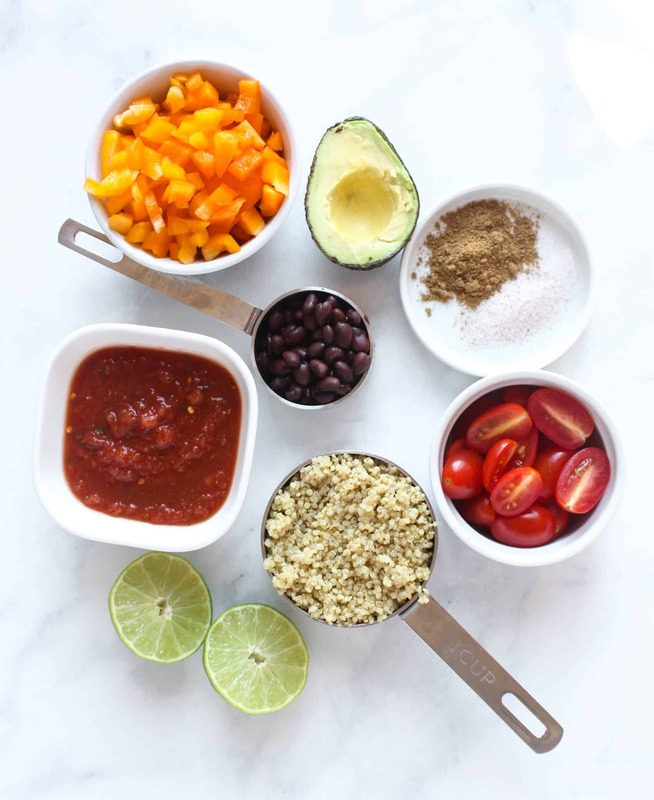 Pin Quinoa Taco Salad Here! Watch my segment making this recipe (and two other delicious lunch recipes) LIVE on Indy Style here! Last week, I was lucky enough to appear on Indy Style and share some nutritious and delicious recipes perfect for a midday meal. 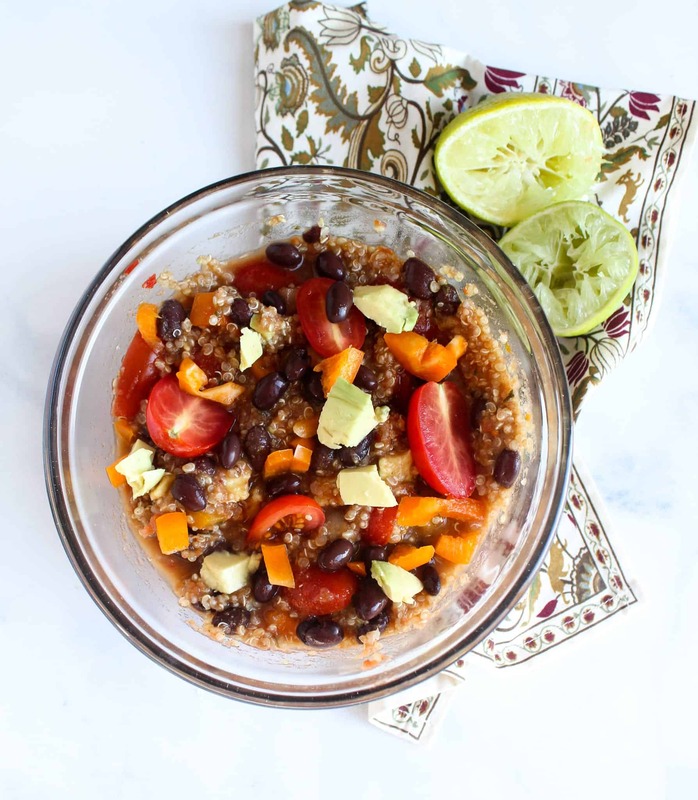 I shared my Tuna Avocado Salad, Mediterranean Quinoa Salad and this Taco Quinoa Salad. 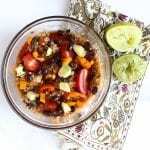 All three of these recipes are simple to make, are only one or two servings, really pack the flavor and are full of nutritious ingredients. Salsa – filled with tomatoes and other vegetables! 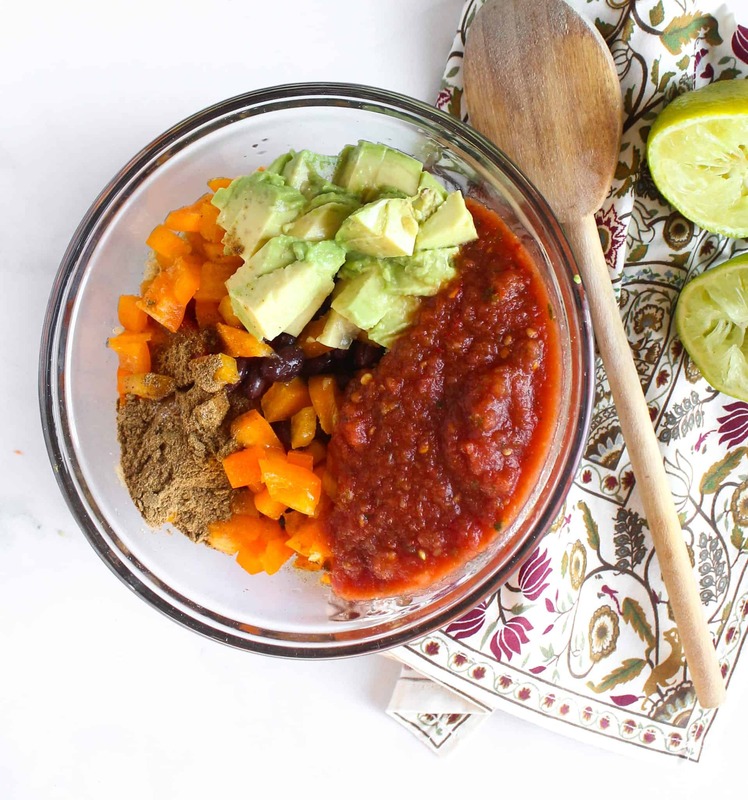 Adding salsa is a great way to sneak in veggies. Cherry tomatoes – good source of lycopene, which is the pigment that makes the tomatoes red and does wonderful things for our bodies. I also added a touch of cumin and salt to boost that flavor even more. Not full enough or feel like you aren’t eating the right combination of foods to energize you and keep you focused into the afternoon. Lack of time for planning lunches. No microwave to reheat leftovers. In a lunch rut and need more options. Looking for plant protein options. When it comes to feeling full and having sustained energy, it’s important to eat a combination of foods giving you protein, fat and carbohydrates at each meal and snack. This will help stabilize your blood sugar levels, energy and keep your focus on point! Pay attention to your hunger cues and if your are consistently hungry in the afternoon, ravenous at dinner or have zero energy to power through the end of the day, eat a little more or pack an afternoon snack (or both!). I get it! I’ve been in busy seasons of life, and I am sure more are coming my way. That being said, I always felt like when I carved out a little time (30 minutes or less) to plan breakfast, lunch, dinner and snacks for the week my mind was a little more free to think and worry about OTHER things that needed to get done. Something I use with a lot of my clients is a meal planner and grocery list template. 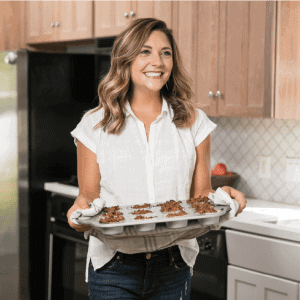 If you sign up for my email list (the link is in a pop-up or at the bottom of the home page), you will receive a download with my grocery list and meal planner template! They are all pretty versatile and can be added to a wide variety of dishes to boost the protein content. And for the other requests…no microwave is required for these meals and hopefully they are new dishes you can add to your rotation! 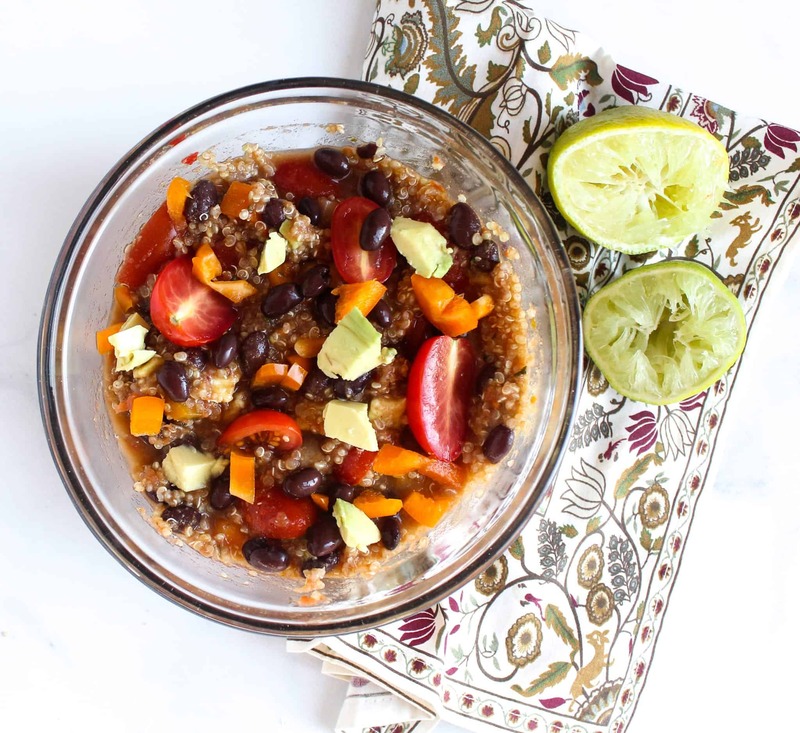 In a large bowl, combine the quinoa, avocado, black beans, cherry tomatoes, bell peppers, salsa, lime juice, cumin and sea salt. *look for low sodium, no salt added or rinse under water for about 1 minute. This sounds like a week night staple dinner for sure! I LOVE this recipe idea! I pretty much use quinoa over brown rice all the time because it cooks so much faster. This salad looks like a great use of it and plus tacos – I’m sold!